The Highlands Memorial Day Parade will take place on Saturday, May 24th at 1:00 pm. 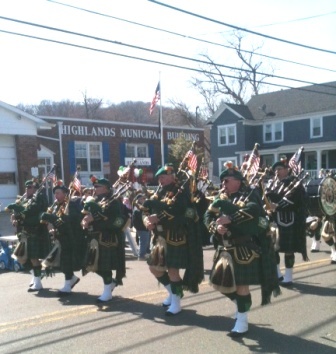 All groups wishing to participate in the parade must contact Christine Franklin at the American Legion at 732-872-2350. Check-in is at Huddy Park at 12:00 noon. We encourage all groups to participate. Also needed are more people viewing this parade. I have watched this parade for over 45 years, and the attendance seems to be dwindling. Our veterans deserve better. It is pitiful to see the empty sidewalks. I am somewhat surprised about the lack of commentary on this thread. While controversy engenders more of a response, it seems a shame that a tribute to our Nation’s fallen seems to go unnoticed. We have seen what “social media” can do. It changed our Borough’s voting system. It got the two candidates who made use of this medium elected. It seems that more people read blogs and face book than read the paper or watch the TV news. It is, perhaps, our strongest weapon to date, for good or bad. Highlands United was a force for the change of our voting system and the election of Mr.
turn out for this year’s Memorial Day Parade. Don’t you wonder why the St. Patrick’s Day Parade is such a success, while our Memorial Day Parades seem to go virtually unnoticed? And, Ireland is one of the few places on earth that has no snakes……So, come on, Highlands United, use your clout !!! Maybe the groups marching in the parade should do their part, like the FD or EMS. Or, maybe, just once, the town could use their means of communication (SWIFT 911, emails) to put out the word. What is the HBP doing to promote this? It’s in their best interest as more people in town leads to more people patronizing our bars. Unfortunately blogs cannot force people to post comments. At least the date was put out there …. Thank You HIghlandsblog for trying to get the word out. Lucille, perhaps you can ask some Council members, and you and your fb friends to post this event on their FB pages to reach a larger audience. May 24th – 1pm – Show Thanks to Our Vets in HIghlands! I don’t really understand why can’t the same people who marched in St Paddy’s parade march in Memorial Day parade? I agree Ms Lucille that it’s a damn shame that’s it’s not bigger and more important parade but not sure why picking on people like blog and Highlands United helps. Not sure what you are so angry about democracy at work. You seem like a very intelligent person. It was the people’s right to change election and than vote for who they felt was best for job. Sometimes I feel like I’m watching certain news channels that can never concede another point if view but stick to the script. It’s getting tired, maybe time to just let it go and just unite for the betterment of all! Seems a shame to have to “force” people to honor our veterans. I’m sure this will soon appear on face book. Hope to see more people viewing the parade this year. Who is being forced? Sorry but not following your drift. I don’t know a soul who doesn’t appreciate our veterans sacrifice. Oh, wow. Not quite the response I had hoped for; but, as old aphorisms go, “There is no such thing as bad publicity” and “it is better to be reviled than ignored”. My comments here were not about democracy but patriotism. I certainly wasn’t “picking” on the Highlands Blogger. I was lauding her on presenting this thread and her appeal for more volunteers to participate in the parade. My statements had nothing to do with the election other than to say that it is my belief that she and her followers were influential in changing our voting system and in the election of Mr. Card. Nothing derogatory about that. I believe in giving credit were credit is due regardless of what my personal beliefs are. As to why the reasons our Memorial Day Parade does not attract the attention of the public as does the St. Patrick’s Day Parade are simply the lack of funds, know-how and sponsorship. Another reason is fun….everybody loves a good time; and, after a long hard winter there is nothing better than getting together with friends and neighbors to celebrate. That tradition goes back to before St. Patrick was even on the scene. I, also, laud Mr. Card’s attempt to spread the word. It is one thing to honor our fighting heroes and another to show that appreciation up front and personal by being there. Let’s hope for good weather and a better turn out this year. Thank you. Took your suggestion, Rockemsockem and posted on the Highland’s FB. Thank you. And on a side note, we are a Republic and not a Democracy. A Republic has a constitution and bill of rights that protect certain inalienable rights that cannot be taken away. And we are darn lucky we are or we would not be posting some of the things that are posted here. This is not really that hard to determine why we don’t get as many participants and spectators at our Memorial Day Parade vs our St. Patty’s day parade. Our SPD parade is after the actual holiday and after all of the other town parades. Every group is available and wants to participate as it wont be another year until they are needed. As for our Memorial Day Parade, we are in competition with several other local towns (Rumson and Fair Haven) as well as the Holiday and unofficial stat of summer itself. Many families have plans in advance to go on vacation, be a cook outs, open the pool, go to the beach, etc on this weekend. This is not an excuse to forget the real meaning of this holiday and why we as Americans are so lucky and why would be should be so grateful but rather just the reasoning for poor turn out.